If you can't turn off your system due to "There are currently no power options available'' in Windows 10/8/7 error , fix it here. If Shut down, sleep, restart options missing from WinX menu in Windows 10, check this fix. Right now in latest Windows 8.1 Update, you have many options to shut down your computer. This includes pressing Alt+F4 key combination until you get shut down dialog, making shut down by right click at Start Button, adding shut down to Desktop context menu, adding power options to taskbar, locking the computer and then shutting it down from logon screen and lastly using Settings Charms Bar (press + I to get this). But today when I was shutting down my system using the Settings Charms Bar, it won’t let me to turn off the system by saying “There are currently no power options available” error (refer above screenshot). So you basically can’t turn off the machine from Settings Charms Bar, and this problem I faced after installing latest updates to Windows 8.1. So how to fix this? Is it a bug? Well, not sure if its a bug, but I hardly suspect that this is due to corruption of power scheme profiles on the system. 1. 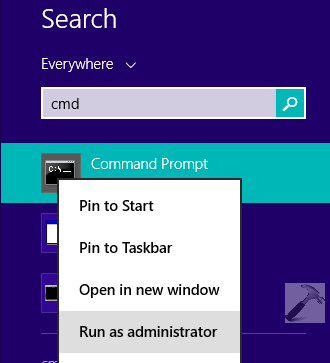 Press + Q and type cmd in search box, right click on Command Prompt from results and select Run as administrator. 2. Next, in the administrative Command Prompt, type powercfg -l and hit Enter. This will give you the list of power schemes available to the system and their corresponding GUIDs. The power scheme currently active is marked star (refer below image), note down its GUID. You can close the Command Prompt and reboot the machine, problem should be fixed by now. This worked for me and I hope it should work for you as well! Of course this is NOT THE solution. If this were the solution a different power plan would give power options, whereas NO power plan displays power option any more. ^^ Have you tried creating a custom power plan as mentioned? This worked for me, thanks dude! This worked once for me but when I restarted same problem. Pls help me. I had the same “There are currently no power options available” issue (Windows 8.1. ), the above solution did not work for some reason. a. Use Properties to open a little window which allows you to add your user id or group (there is likely to be a Add User or Group button). 5. Sign in again: suddenly, the Restart & Shutdown options were available. And they work for me now. I’m not an expert, though, so I have no idea whether this might help other people. Sorry its doesn’t works on the domain users level. Upgraded into windows 10 pro v1703. I found this solution this evening. It worked on all the domain user computers I tried it on in the office. I got this advice from this thread.